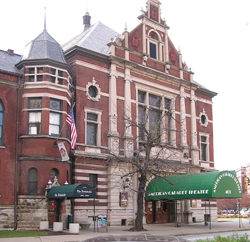 Das Deutsche Haus, now called The Athenaeum, is the best preserved and most elaborate building associated with the German American community of Indianapolis. Germans constituted a major social and cultural force in the city, and the opulent Northern European Renaissance Revival style of the building is architecturally unique in the community. German social life extended to European-style clubs and institutions. Das Deutsche Haus is the best example of this in Indianapolis. The founding group was a Turnverein or gymnastic club. The German American community founded the Indianapolis Trungemedinde (Gymnastic Community) in 1851 and changed the name to Socialer Turnverein (Social Gymnastic Club) later. The Turnvereins were for more than athletics; the movement advocated intellectual and physical health. In Germany, these clubs contained theaters, classrooms, gyms, dining halls, and beer halls, just as Das Deutsche Haus does. Originally the building also included a bowling alley in the basement. The group began by building the east wing in 1893-1894, followed by a large west wing in 1897-1898. German American architects Vonnegut & Bohn designed both sections. It was the company’s first major commission. The Vonneguts, together with Bohn and a later partner, Otto Mueller, designed schools, churches, department stores and numerous private homes in Indianapolis. Bernard, the first architect of the Vonnegut family, was the grandfather of modern novelist Kurt Vonnegut, Jr. The club survived through the anti-German popular sentiments after World Wars I and II, renaming itself to a more neutral “Athenaeum.” An ongoing restoration started in the 1990s has reclaimed the glory of its 19th-century years. The architecture is unique. Vonnegut & Bohn selected a 19th century version of German Renaissance Revival for the building. German Renaissance influence is clearly seen in the banded stonework and columns, the scroll-topped gable ends, round-arched windows, and lofty hip roof with domed dormer windows. The building also includes a remarkable collection of leaded art glass windows. The interior contains the original theater space, rehabilitated to house the American Cabaret Theater, and the original Rathskeller restaurant, the oldest restaurant in town. The back walls of the complex enclose a Beer Garden with a bandstand, still used for live music in season. Das Deutsche Haus, The Athenaeum, is located an easy walk up Massachusetts Ave. from Monument Circle, at 401 E. Michigan St. General building hours are 11:00am to 9:00pm. Visitors can enjoy dinner in the Rathskeller or take in some live music and libations at the Beer Garden. Visit the Athenaeum Foundation for more information on tours and events. Das Deutsche Haus has been documented by the National Park Service's Historic American Buildings Survey.